Dinner time can be rough – after working all day the kids want my attention, we are all hungry (possibly cranky), and dinner isn’t going to cook itself. 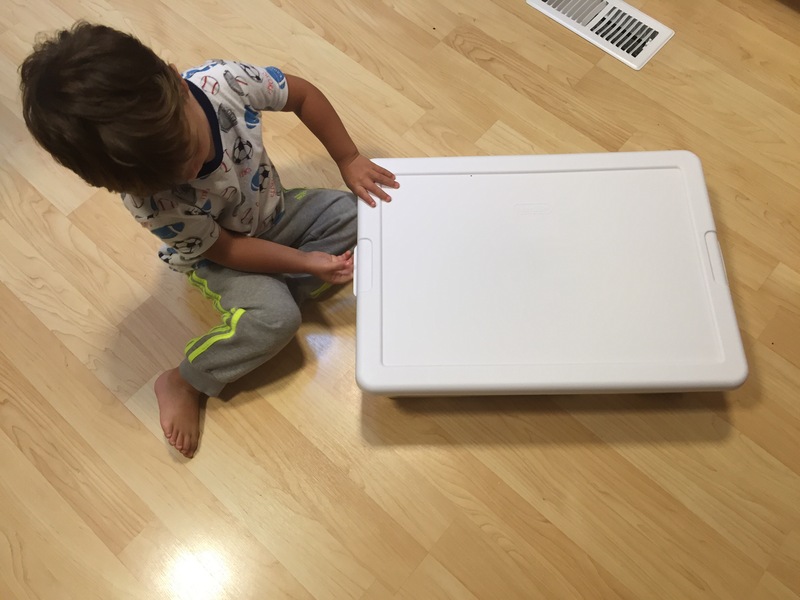 This activity keeps the kids calmly entertained, and is great while you’re trying to make dinner, or for calm play before bed time or nap time. Because they do this activity in the kitchen, it keeps them nearby when I’m cooking dinner. My mom gave this to William for his 3rd birthday, and we got a solid hour of play out of it (which is an eternity in toddler time). After that he’s used it for 20-30 minutes at a time (which is still long in toddler time). It was an awesome, and I actually remember doing this (and loving it) as a kid so it brings back good memories. You could fit several more boxes of the stuff in there, but all you really need is a shallow layer. Dump the corn meal inside the container and top it off with toys. You could use measuring cups, cooking utensils, kids kitchen toys, or figurines (Mickey Mouse, Daniel the Tiger, G.I. Joes or whatever you’re in to). 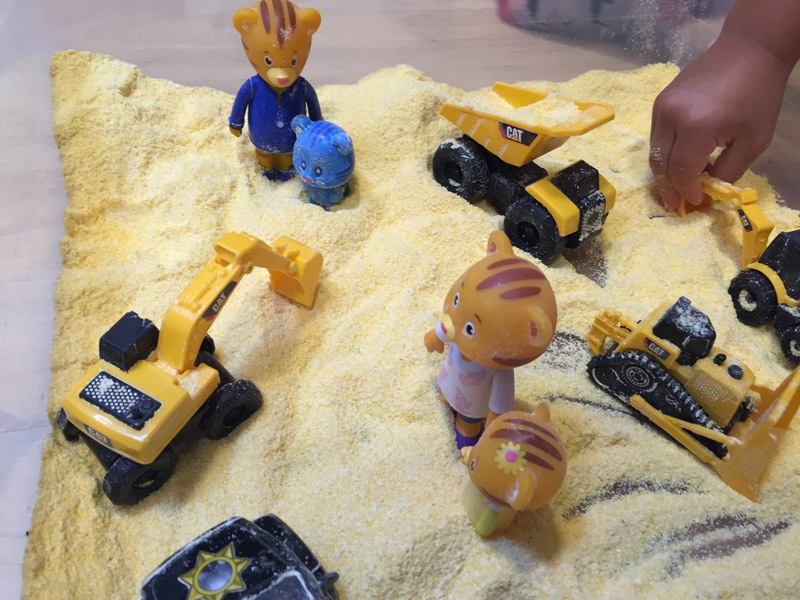 My mom picked some little dump trucks and tractors for William and a set of Daniel the tiger figures. I suggest playing in the “sandbox” on the kitchen floor. Corn meal does make its way out, but it’s super easy to sweep up. You’ll see above that my 6-year old also loved this activity. When play time is over, just put the lid back on. All the toys in our box stay in there, it makes it easy to set up and clean up. What are your favorite sensory play activities for kids? What time of day is the most challenging for you? 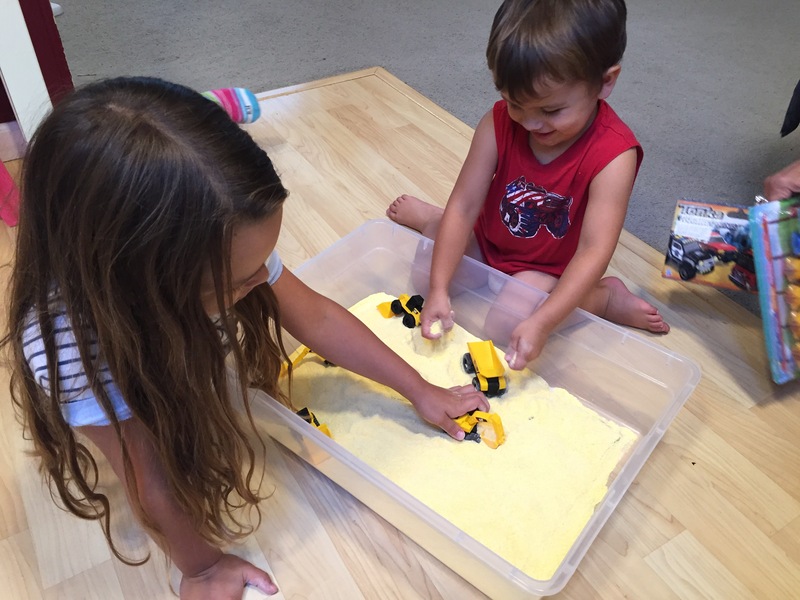 Check out toy tractors on Amazon to start preparing for your corn meal sandbox today! This is a great idea.Can’t wait to try it out for my doll ! I’d love to hear what you think when you try it! I may love it just as much as my kids.